The State of Colorado Department of Revenue has selected the AB700 RFID handheld reader from A.C.C. Systems Inc. for the management of medicinal marijuana plants. The Department of Revenue requires the use of a radio frequency identification system for the management of organic plant growth and has qualified and selected the AB700 RFID reader to assist with legal compliance. The AB700 handheld RFID reader with the Impinj Indy R2000 RFID reader chip will ensure the fastest and most reliable scanning of all EPC ultra-high frequency (UHF) tagged plants and related assets. Systems Integrators and other government agencies including NASA have selected A.C.C. Systems’ line of RFID readers after bench testing all competing devices. What makes the Nautiz X8 different from competitive products on the market? The Nautiz X8 not only meets MIL-STD specifications and IP ratings common to other devices on the market but has unique properties that differ from other alternative products. The Nautiz X8 has a very large 4.7” capacitive touch display AND physical numeric keypad for easy data entry. 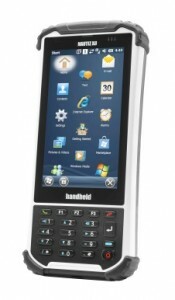 Typically industrial devices boast a 3.5” screen size with small physical keypad for data entry OR a full screen with no keypad. On-screen navigation is no longer a hassle when holding the Nautiz X8. In both landscape and portrait mode the user can swipe across the screen and even manage tasks that used to be painstaking due to small screen sizes (such as managing a mobile spreadsheet). A few features really stand out when using the Nautiz X8. Before even turning the device on any current user of mobile computers will agree that the X8 is shockingly light in weight. Considering the large display and installed 12 hour battery the X8 only weighs 17 oz. which is 20% less than industry leading 3.5” screen devices. The X8 was clearly developed with the idea in mind that HandHeld didn’t want to isolate users of a particular operating system preference. The Nautiz X8 can be configured with either Windows Embedded HandHeld (Windows Mobile) or Android which is excellent for users of either preference. Install an off-the-shelf Windows Mobile program such as ESRI’s ArcPad or deploy your own enterprise Android app – in either case enjoy your software on a stunningly bright 600 NIT outdoor visible screen (even in direct sunlight). Feel free to contact our product sales manager at A.C.C. 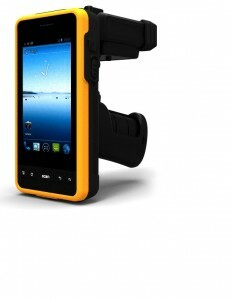 Systems, Inc. For further information or to purchase this device, please visit our website: www.accsystemsinc.com The Nautiz X8 most certainly raises the bar in the rugged mobile computing industry. The X8 takes all of the favorable features found in other devices and combines them into one package (battery life, screen size, display brightness, OS selection, cell modem option). Based on performance, price and features, the X8 will most likely dominate in the GIS, Land Surveying, Construction, and Forestry industries. NASCAR, the National Association of Stock Car Auto Racing, has begun scanning racecar tires embedded with RFID chips with handheld RFID readers from ACC Systems Inc. of Bohemia, N.Y.
NASCAR, the second-most-watched sporting event behind the National Football League has three major divisions; the Craftsman Truck Series, Nationwide Series and Sprint Cup Series. While none of the vehicles in the three different divisions look the same, nor do they perform equally, all three groups share one thing in common — each NASCAR vehicle must use Goodyear Racing Eagle tires. That’s a lot of tires — and Goodyear can identify each one thanks to an RFID chip embedded in every tire. When Goodyear tests tires, they select certain drivers from each of the four manufacturers in NASCAR and pick tracks they would like to use to acquire data. These drivers bring their own cars and teams and run lap after lap at the designated tracks. Tire engineers record tire temperature and other data to take back to the manufacturing plant where chemists will determine the proper compound to use when they make new tires. In order to keep track of the tires, Goodyear implants small radio frequency identification, or RFID chips, inside each tire. In addition to race day tires, Goodyear also leases 200 tires to Sprint Cup, 160 tires to Nationwide Series teams and 120 tires to Craftsman Truck Series teams to be used on non-sanctioned tracks for tire testing. The RFID chips allow NASCAR to monitor the testing. In the past, tire testing was seen as a nuisance by some teams. But in an attempt to equalize the competition and lower costs, NASCAR continues to limit the number of tire tests that teams can conduct throughout the season. Tire tests are suddenly a hot commodity as testing is now at a premium. Teams can go through as many as 12 sets of tires during a race, depending on which track the cars are racing on. Goodyear chooses what tire to bring to each race track based on the data gathered from testing and past races. The Nationwide and Craftsman Truck series have tire rules that limit the number of sets of tires teams can use for each race. At every race, NASCAR officials use the ACC570 RFID handheld readers to verify that each team car is using only authorized Goodyear tires. ACC Systems Inc. is an international Distributor, Manufacturer and OEM Supplier of RFID Readers, Tags, and Accessories to Systems Integrators, VARs and government agencies serving the Supply Chain, Healthcare, Asset Identification, tracking and Real-Time Inventory, ACC Systems Inc. is also the producer of the first Tri-frequency handheld reader. Feb. 10, 2014 – Bohemia, N.Y. – A.C.C. Systems Inc., a leading manufacturer and distributor of wireless portable hand-held data collection devices in compliance with EPC- Global and the Department of Defense requirements, today announced that the ANDY-500 RFID Android OS mobile handheld computer is now shipping. At about half the size of the Motorola MC9090, smaller and lighter than the MC3190 and more durable (IP65) than any of its competitors, this work-horse reader outperforms every popular brand of RFID handheld on the market today. Its Android OS also outperforms the Microsoft PDA OS versions with more and better buttons, faster browser, better speech recognition and ability to create mobile Hotspots. Beyond outstanding performance, the ANDY-500 also offers more add-on features than its better-known bulky competitors. Choose from GSM/GPRS, CDMA, HSDPA to GPS and from 1D/2D barcode to 5.0 MP flash camera all on the same unit with UHF, WiFi, Bluetooth and Gun handle w/extra Lithium-Ion 3.7v 4,400 mAh rechargeable battery. The ANDY-500’s primary internal battery offers a Lithium-Ion 3.7v 2,260mAH and a back-up Lithium-Ion 3.7v 80mAh both rechargeable and replaceable. The main battery is good for 9 hours with the 2D barcode imager based on 500 scans in one work day. Aside from the standard WiFi, it also supports the 5GHz WLAN. In addition to reading EPC GEN 2 Tags, the UHF model also reads ISO/IEC 18000-6B tags. The powerful ANDY-500 integrated RFID module enables it to outperform the major brand readers. If 13.56MHz tags are present, the HF model reads ISO 15693 and Mifare, ISO 14443 Type A and B tags. Along with higher margins for resellers this makes the ANDY-500 the obvious choice for professional and industrial strength RFID handhelds for your top clients. A limited number of discounted UHF Starter/Demo kits are available. Call for pricing. The Starter Kit includes a color touch screen(480 x 800 pixels), UHF for C1G2, WiFi and 1D barcode laser, 2260mAh battery, power supply, USB data cable, SDK, demo software, source code, user manual, one year warranty & sample tags. Additional features from the Option Price List can be added to the Starter Kit. No other RFID reader on the market can compare to the performance and handling of the ANDY-500. ACC handheld readers are currently being used by NASA for duty on the International Space Station. Disney and NASCAR also use these readers to track costumes and racing tires respectively. If your project requires a Mobile 6.5 OS check out our AB700 device.